Does it matter that Britain lost its AAA rating? On Friday, the UK became the latest country to lose its coveted AAA credit rating as Moody’s (one of the “Big Three” ratings agencies) issued a downgrade based on what it described as Britain’s “sluggish” economic growth. The UK now joins France and the United States on the list of countries that have suffered a downgrade since 2008, leaving Germany, Australia and Canada as the only G20 economies with spotless AAA ratings. Whilst the move is widely seen as a political humiliation for the British government, the economic consequences have been muted. 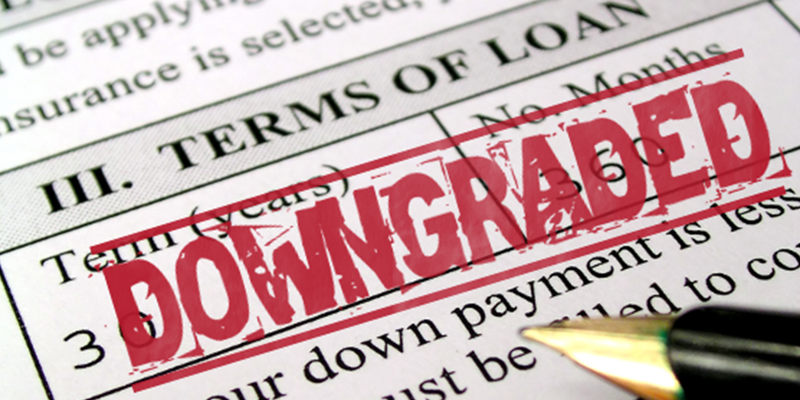 The downgrade had been anticipated for some time, and critics argue that the agencies lost their credibility long ago through their failure to predict the financial crisis. I always have to wonder why the politicians in Europe are not brave enough to just forbid ratings from private agencies and create a European Rating Agency (similar to the energy and telco regulators) that rates countries and big companies in Europe according to clear and transparent criteria and formulas. Should Europe have its own ratings agency? We took this suggestion to Gunnar Hökmark, a Swedish MEP and Vice-Chair of the centre-right European People’s Party group. How would he respond to Daniel’s suggestion? What do YOU think? Will there be any economic fallout from the UK’s credit rating downgrade, or are the consequences mostly political? Do the rating agencies still have any credibility after failing to predict the financial crisis? And does the EU need a European Ratings Agency to guarantee clear and transparent ratings? Let us know your thoughts and comments in the form below and we will take them to policy-makers and experts for their reactions. agancy ratings are connected with the government of each country in order to produce financial results and make a difference in global financial system. the ratings are not true and do not represent the economic situation of the rated country. i do not know the reasons of these ratings but for sure some people gain a lot of money. It seems to me that rating agencies make somewhat biased conclusions, their “judgements” should, at all times, be only partially considered. I used to work at the legal department of a French bank and my job was to set up automatic derivative transactions according to the clauses of the agreements signed by the counterparties. As guarantee, we used bonds or cash, but in most agreements only bonds of those states that were rated AAA by three most important rating agencies (S&P, Moody’s & Fitch). Seeing the transactions are automatic nowadays, if a state loses its AAA rating, its bonds won’t be purchased by the investors. So how do you think the states raise the money on the markets (which they must, in order to finance welfare state, as taxes aren’t sufficient)? Losing a rating is a catastrophy to any entity, be it a state. Ok, I am not at all an expert in economics but the last two years I have been astonished about the way things work and these rating agencies is one of the things that are absurd to me. I believe this big rating agencies cause a lot of damage to countries and in the end it is to the expense of the citizens and they have proven not to represent the true situation . So I hope it is not important that Great Britain does not have the AAA rating anymore and I hope they gain less imporantce during the years. We are all trapped by rating agencies. Europe is ruled by monopoly of rating agencies which has never situated in european area. For me, yes Europe DOES need its own rating agencies.. As things stand at the moment, the rating agencies are based in USA and guess under whose criteria they upgrade or downgrade countries? Yes, it all happens according to the American criteria, or interests. If we want a fairer deal, like everywhere else, we need to set up more voices in this sphere too.. The more voices and opinions, the more fair and accurate… I am glad that now more and ore European countries, especially two of the “big three” in the EU have lost their AAA. Maybe that will give them a good kick up in the back-side and force into doing something about it. When such things happened to small economies, they did no sweat, but also they laughed it off… Now it gets serious for them too… See what they do next!!! Hahaha!! I think that rating agencies are not transparent at all and they act according to interest of investors. This “influence” acts always as speculation and consequent desregulate financial markets. The most important agencies are american and they shouldn´t. In this deep economical crysis special in Europe, creating an agency in this moment I think is not the best option because Europe is now with its credibility low. This European agency shoul be created long time ago but not now. I also think that the downgrade from AAA of UK is not a major economic problem but it can bring some political instabilty specially because 50% of english people dont want to belong to eurozone with actual conditions. So I think this downgrade will inflame a little UK position towards Europe. The EU. is a Total Shambles. Failed us all. A suggestion that fits just right. The reason to take the problem head on and be good men, honest men with his people, with humanity, and not be a puppet of financiers and bankers, paid their salaries while the people with their taxes. The solution is quick and powerful, which would end the artificial crisis manufactured and which will come through the food bubble, which will cause a huge proportion famine. Bankers are not the masters and lords of the money of the people. citizens are the masters of their destiny. Because if the people are not masters of their fate and the fate of the people is determined by these corrupt bankers and traders, must be brought to justice for the atrocities they have committed so far. You can not take a benefit without admitting liability. Bankers, financial and political consenting to what happened all these must go to court and be tried as criminals for treason to the states, understood as the set of state of a country’s citizens. The EU is OK. And will support the UK. I am pretty sure. Just as the EU does not drop Greece or Cyprus. We just have to see: The EU is not Brussels. The EU are we all, who live in ths area. And there has never been a more peaceful period in Europe before. Call me whatever. I prefer politicians discussing whatever in Brussels. Maybe we have different opinions. Let’s discuss. But never let us be enemies again. There are several issues with the UK AAA downgrade. The first, and it maybe coincidental, is that is manages rather handily to put downwards pressure on Sterling at a time when it seems all major currencies are trying to devalue and the IMF is warning of a currency devaluation war. Very useful in the short term for UK exports. Taking a longer view, an increased cost of borrowing is not something that effects the UK now significantly – but when the debts are due who knows what position the UK will be in? As for the independence of the credit agencies, as always it is a question of following the money to see who pays for them to exist at all. Just as no academic or think tank will bite the biased hand that finances them in return for “thinking along those biased lines”, neither, ultimately, will a credit rating agency go too far against the bias expected by those who finance them. As for the credibility and credence the average person gives such entities, it is a question of cause and effect. Whether I give them any credence or credibility matters little – it is the world of finance and politics that will ultimately support or undermine them – and that brings back to following the money that pays for these agencies in the first place. Should the EU have its own? Well China has its own but very few people take much notice of it outside China. Would anyone take much notice of an EU credit agency outside the EU? The rating agencies were part of the problem and what created the crisis in cooperation with the deregulated banking system! It is the political institutions which have lost all credibility since they were supposed to prevent such a system in which millions of people have been left homeless due to the greed of a few financial giants! Asking if the rating agencies still have any credibility after failing to predict the crisis is like asking if the Gestapo is still believable since it failed to predict World War 2. They’re the ones who created it! The elected representatives are the ones who were supposed to protect the people against such interest groups but failed. This is why the Europeans should show the “People’s Party” the door! They are responsible either through the sheer incompetence and lack of foresight or worse, through being accomplices of those interest groups in the first place! Triple A and any other rating is a fix by those who run the show. And our Chancellor Osborne knows it. It’s another scam to enable the Tory government to reduce the standard of living, especially of those already suffering and do it with the creeps who vote for them to stay on their side as they impoversih the country further. And what is he planning to do with it? Well, he is giving the Oil Corporations huge tax break as they are not wanting to produce from the North Sea, unless, we, the tax payer, gives them a large sweetener to do so. And here is a way of selling the lie to the public. Here is a spoof that speaks reality. As a more serious assessment of what this lunacy is all about. Basically, it is another money making squeeze on British tax payers and its public in general, whilst his friends make more out of them. Yes!!! Rating agencies. The dream of dreams! The economical Nirvana! Relax, never worry, we are AAA – Anti Aircraft Artilery!!! Should the purpose of the economical system itself be the pleasing of some ‘raters’? May it be done and made with the best of intentions, should some individuals have the power to cripple a whole nation’s confidence? As it is some kind of end, rating is also a very powerful and dangerous mean!!! Supose we create a rating agency at european level. That would be a public institution. It would, in theory, serve public interrest. How does public, and by this I mean citizen X of every european country, benefit from rating? What general good do we pursue when we stimulate competition at the same time with a unified idea of Europe? What exactly do we need rating for??? Credit rating agencies were there for many years. There was no doubt for their credibility. No one was saying that there was a political influence behind them as long as we were keeping the AAA rating. All of a sudden we have started having second thoughts by loosing this rating. I do not think that this is the right way to interpret the European Crisis. There are many causes of this crisis and this is only the tip of the iceberg. 1. located within the US so that government can “guide” them into their interest – and their interest is too weaken the EU – despite what the smiling Obama says. 2. These “RATING” agencies are corrupt to the core – they cause the crash by labeling toxic assets as AAA. So why would anyone care about their voice anymore? In fact the market already knows this and Moody’s and these other so-called “big shots” are now nothing more than a voice who no one ever bothers to listen. UK lost nothing. Europe lost nothing. Those ratings don’t mean squat – the investors know that. Daniel seems to suggest that a ‘European rating agency’ would solve all problems. The only flaw in the plan is this. If any rating agency rated according to clear and transparent processes, almost every western country’s bonds would be rated as junk bonds. Because that is what they really are. The rating agencies are way behind the curve. Not a single Eurozone country can be rated AAA. A chain is only as strong as its weakest link and therefore all countries in the Eurozone should be rated according to the weakest link, Greece. In other words, they’re all junk bonds. The US bonds are junk too, for different reasons. If countries don’t borrow money, the opinion of financial markets and rating agencies becomes instantly meaningless. Countries shouldn’t be allowed to borrow money. Balance budgets, don’t spend money you don’t have and look at how powerless these financial markets really are. It is a matter of supreme indifference to me if someone tells me they’d charge me 10% interest. Because I will tell them I don’t need to borrow money from them. Just as long as the undemocratic EU is dissolved and the wealth-destroying Euro disappears it is all fine with me. The Euro is responsible for mass poverty and unemployment in ‘Club Med’. When the USA lost their AAA status it stopped being meaningful. What matters are the interest rates we pay, not the label we’re given. Haven’t they done enough being one of the main responsible for the 2008 crisis? They cannot be trusted, and finance in general should be regulated! An impressive share! I’ve just forwarded this onto a co-worker who was doing a little research on this. And he in fact bought me dinner because I discovered it for him… lol. So let me reword this…. Thanks for the meal!! But yeah, thanks for spending the time to discuss this matter here on your blog. It is not all about borrowing money since no country survives independently.. The point is that the rating agencies have to be replaced and adopt transparency.. They rated without considering the fact that unequal ballance of trade exist among nations.. The world powers are favoured in all aspect of transaction and. exchange.. The third world nations are geting poorer due to the unequal conditionaties of monitary institutions such as the world bank and the IMF.. I wonder why the conditionalities to borrow and pay back can not be general.. Transparency is what am preaching..